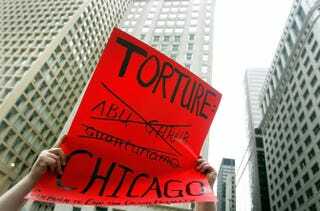 Adam Turl displays a sign regarding police torture during a demonstration July 21, 2006, in downtown Chicago. Chicago is trying to apply closure to a scandal that continues to haunt the city. Mayor Rahm Emanuel and several city aldermen proposed Tuesday a $5.5 million reparations package for victims of police torture, reported the Associated Press. The package will be introduced Wednesday to the City Council. “Today we stand together as a city to try and right those wrongs and to bring this dark chapter of Chicago’s history to a close,” Emanuel said, according to AP. Attorneys for the victims say that disgraced former Chicago Police Commander Jon Burge oversaw the torture of up to 120 men. Burge’s so-called midnight crew used torture to obtain false confessions from suspects in the 1970s and 1980s. Burge was convicted in 2010 of lying about torture in a civil case. He was released in February from a halfway house after serving four-and-a-half years in federal custody. One of the outspoken victims, Darrell Cannon, described the reparations package as a “landmark” for those like him who fought for justice. “This is the moment. What we do here will not be undone. People across the country will talk about Chicago,” he said, according to AP. Cannon confessed to a murder he didn’t commit after the police put an unloaded gun into his mouth. He was released from prison after a review board ruled that the evidence against him was tainted. Cannon served 24 years in prison. In addition to an apology, the reparations package includes free City Colleges of Chicago tuition for the victims, their immediate family and grandchildren, according to the Chicago Tribune. They will also be eligible for free psychological therapy and substance-abuse counseling.